For many Americans, the Thanksgiving holiday is a time of blessing and gratitude that facilitates the coming together of friends and family both close and disparate to break bread, reflect upon each others' lives and relationships with each other, and to contemplate the depths of their unspoken disdain. For other Americans, like me, Thanksgiving is all about Black Friday. The busiest shopping day of the year comes with bargains accurately advertised as "insane," and they're to be found in virtually every dimension of the retail universe. It's the ideal time of year to fill the deep, dark holes in our souls with material goods that reflect or enhance our personal brands and lifestyle idioms, and you can believe comic book merchants are getting in on the action. 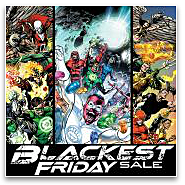 Click after the cut for a list of some comics-related sellers who will be offering some unbelievable bargains on Black Friday. Venerable retailer Things From Another World has been having a sale all week, and by Friday discounts will be as high as 80% on products including comic books, graphic novels, statues, toys and more. The site is also unlocking additional rewards as TFAW's Twitter and Facebook activity increases, so be sure to check out everything that's going on over there. 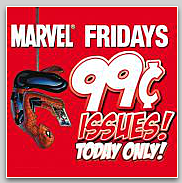 Daily deal superstore Thwipster tells us they'll be offering big savings on perennial favorites like Absolute Crisis on Infinite Earths (50% off), Absolute Justice (45% off) and Absolute Identity Crisis (40% off), in addition to its usual bevy of discounted graphic novels. DC Comics and its digital partner comiXology are having a Blackest Friday sale, with loads of DC digital issues discounted to just $0.99 each. Also at comixology, Marvel is selling all digital issues of Jonathan Hickman's Fantastic Four for just $0.99 each. 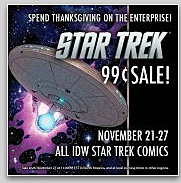 comiXology's IDW store has loads of Star Trek comics for $0.99 per issue. Longtime online retailer Khepri has impressive bargains for Black Friday, adding an additional 40% off all their discounted hardcovers. Click here for the details. Toy seller Big Bad Toy Store has already begun the festivities with deep discounts on action figures and the like from the distant past to the present day. 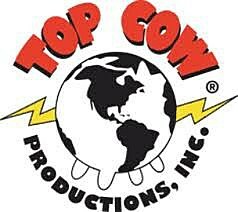 Comics publisher Top Cow Productions is offering a 60% discount on products in the official Top Cow Store. Stick around on Saturday and Sunday for 40% off on other items. Mondo, the collectible art boutique arm of the popular Alamo Drafthouse cinema chain, will offer its first product created with DC Comics. Illustrated by JC Richard, "Fortress of Solitude" will be available for $50 on Black Friday in the Mondo store. Toys, action figures, bobble heads, and other collectibles are available at Entertainment Earth's Black Friday sale. There are also options for free shipping. The great toy collector resource, MattyCollector has a special deal for Black Friday where if you purchase any three 12" Movie Masters figures all on the same order, you'll get them at 50% off the regular price. 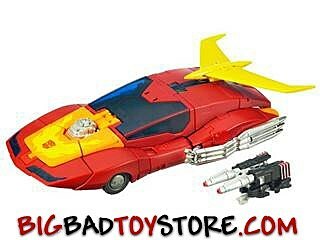 That and more bargains at MattyCollector.com. New York's Midtown Comics is offering some special deals for online customers: up to 50% off statues and toys, 40% off all graphic novels, books and manga, and 25% off all comics and back issues. 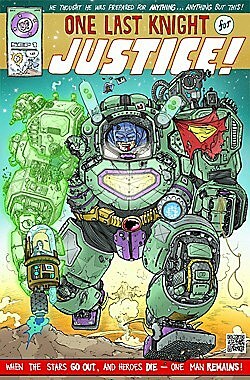 You can get 45% off CheapGraphicNovels.com's massive list of trade paperbacks and hardcovers, which the site describes as "the mintiest books available" and sent in "'bomb proof' padded boxes for ultimate protection!" Artist Ulises Farinas, who's created some original pieces for ComicsAlliance, is having a Black Friday sale on prints. 11 x 17 prints, including the image above, will be on sale for $10 while supplies last. Comic book apparel website SuperHeroStuff is offering a wide variety of hats, t-shirts, sweaters and other clothing items at considerable discounts all week. Check 'em out. T-shirt merchant Threadless is counting down the seconds until Black Friday, when the site will open for a special $10 sale. Use this link to shop when the time comes. While not a Black Friday sale, Dark Horse Digital will have a crazy Cyber Monday sale where you will get a 50% discount off your entire purchase from the publisher's deep library of fine digital titles. Audiobook producer Renegade Arts Entertainment is offering 30% off all downloads through Sunday, making some as little as $0.69. Take your pick from the best stories of Edgar Allan Poe, HP Lovecraft, AC Doyle, MR James, Ambrose Bierce, Charles Dickens and more. As well as Hellraiser star Doug Bradley himself reading stories. Also horror heavyweights Robert Englund and Jeff Combs. UDON Entertainment is offering big savings on some handsome volumes like Street Fighter II Ultimate Edition, discounted to $59.99, and the UDON Store-exclusive Mega Man Tribute hardcover, priced at just $39.99.